Ever since the Blue Line opened 10 years ago, there has been a noticeable gap in pedestrian connectivity between Uptown and South End. 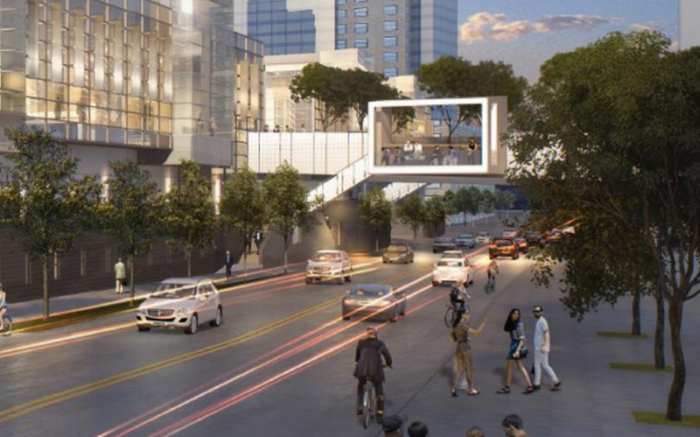 On Monday evening, Charlotte’s City Council met to discuss a number of high profile projects, one of which piqued my interest more than the others. 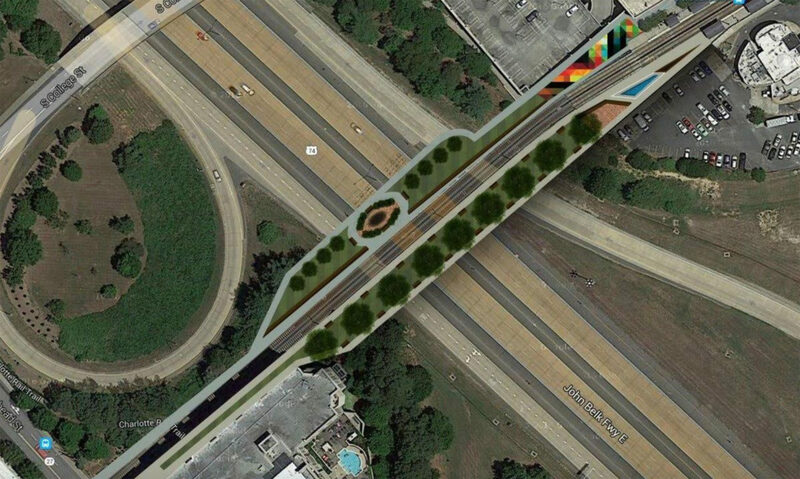 It’s something I’ve followed for over a decade — the possibility of building a bridge to connect the South End and Uptown portions of the Rail Trail that currently break at I-277. 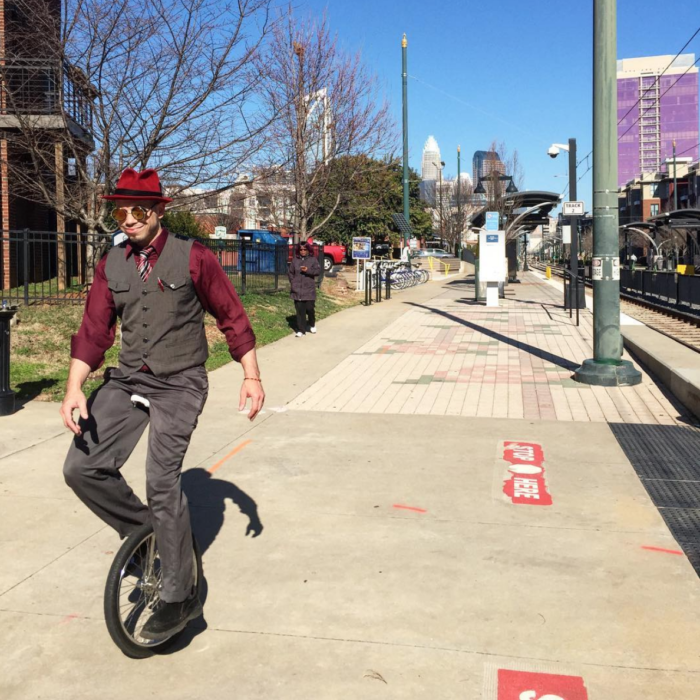 This gap has become that much more evident recently, as the Rail Trail, Charlotte’s answer to “The High Line,” has developed into one of the city’s greatest assets. The original plan was to include a pedestrian connection attached to the light rail. Unfortunately, when costs spiraled out of control and political favor waned, the planned connection was lost to the cutting room floor. Council, with a noticeably positive tone, seems to be looking to correct a wrong that was made so many years ago. This possible Rail Trail bridge project, along with CRVA’s planned pedestrian walkway spanning from Stonewall Station (home of Whole Foods) to the newly renovated/expanded Convention Center, would fill in a 3 block gap between currently developed portions of the Rail Trail. While on the surface I agree with the idea, I want to discuss the pros and cons of a new pedestrian bridge. 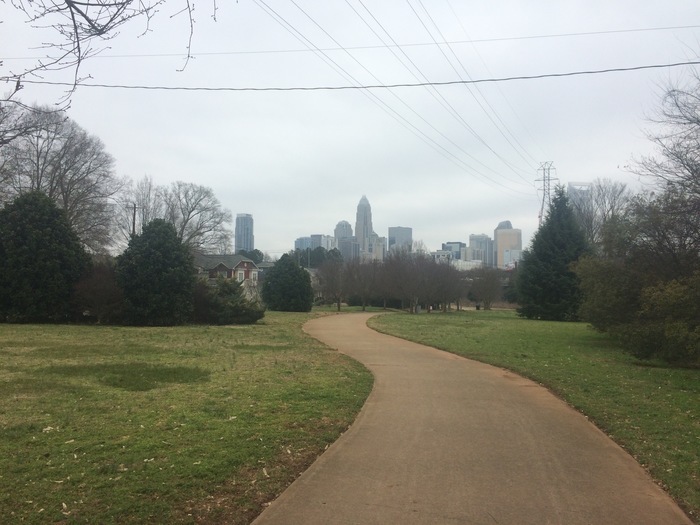 Charlotte’s Rail Trail has become a huge asset for Uptown over the past five years. It’s transformed, bit by bit, from an unshaded, five-mile-long asphalt pathway with bits of grass here and there, to a cultural destination filled with art, engaging public spaces, and places to stroll, grab a bite to eat, and just hang out. As it has grown, one thing has remained a roadblock: the lack of a seamless transition between Uptown and South End. 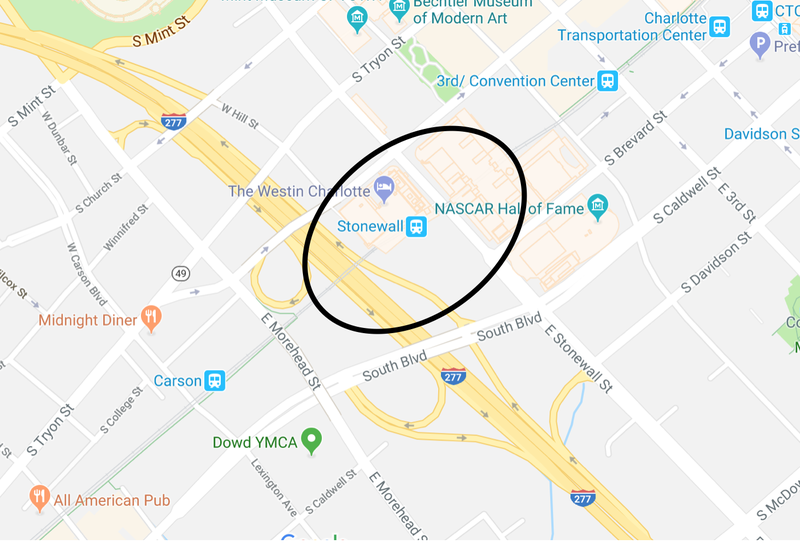 Connections certainly exist, at both Caldwell/South Boulevard, and Tryon, but nothing flows quite as nicely as the straight line of the potential bridge. Charlotte gets a bad rap for being bland and soulless. It’s not a completely unearned label either. That said, the city is rapidly growing, as is its creative class, and as a result, the city has slowly embraced creative methods of making Charlotte a more interesting place. The Rail Trail is the best example of this in Charlotte. 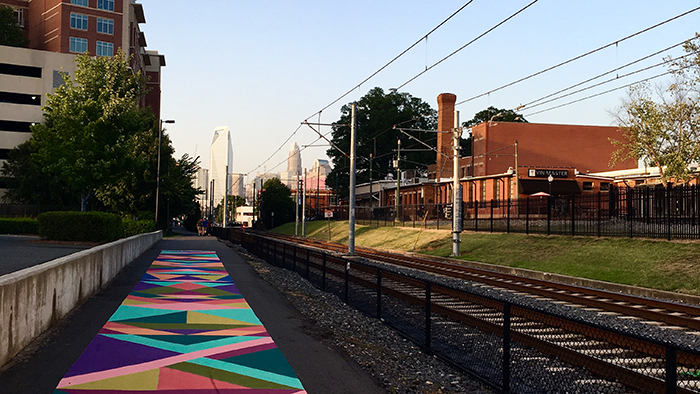 Street art recently started taking Charlotte by storm, but it doesn’t have the function and permanence that the Rail Trail exudes. If Charlotte wants to have an urban asset that is the envy of our peer cities, the Rail Trail has the chance to be just that. A chief complaint when a city project is discussed is always money, specifically where it’s coming from. When the Panthers need a renovation, there’s an uproar with public money. When a billionaire wants to bring in Major League Soccer and requests a huge subsidy from the city/county, we see the same level of uproar. But in the case of the pedestrian bridge, there’s a clear plan in place and money “set aside” by private entities to make it happen. I think this is a nice precedent, and I’d like to see this kind of investment in other transit-oriented areas – for instance opening a new light rail stop at Atherton Mill, another huge gap in the Blue Line. IS THE PRIVATE INVESTMENT ENOUGH? 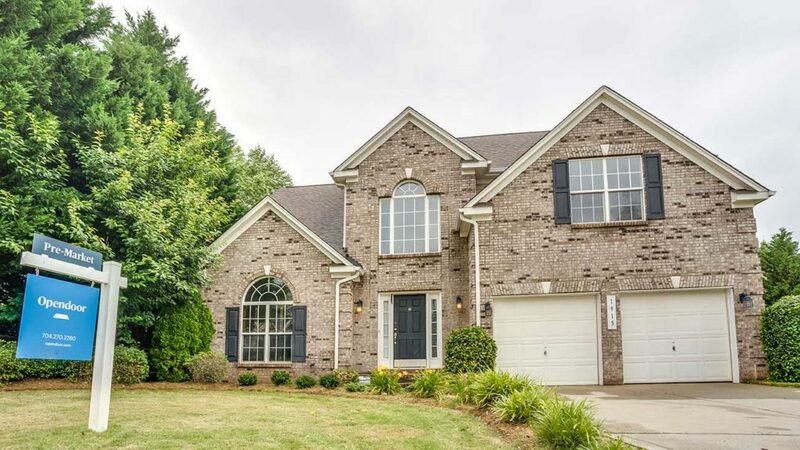 $1.5M represents about 13.5% of the overall price tag of this project, which is pretty good. I just wonder if it’s enough. There are dozens of companies and organizations that directly benefit from Rail Trail connectivity. 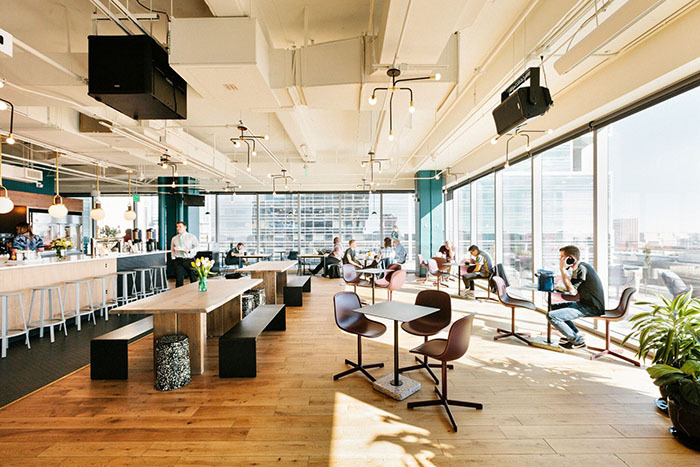 Portman Properties, Crescent Communities, Westin, CRVA, WeWork, Camden, Asana, WholeFoods, Trinity, and Regions Bank all directly benefit from the creation of this link, whether it be for workers, shoppers, residents, or hotel guests. You could extend its sphere of influence to include Lincoln Harris, Northwood Ravin, White Lodging, Home2Suites, Even Hotel, etc. My point is, I’d like to see to see the private investments reach $2.5M to give the project an extra $1M to spread around to create something truly iconic. Some of the companies along Stonewall are printing money because of their investments. I’d like to see them give back a little bit more. I’d also like to see community involvement, through fundraisers, crowdfunding, etc. These methods might be a small drop in the bucket, but this should be an asset for the entire city to enjoy. COULD THE MONEY BE SPENT BETTER ELSEWHERE? One concern here is spending $11M on a bridge, when the county has fallen so short on all of its greenway development projects, delivering only 49 of a promised 129 miles of greenway trails by 2018. The question is, how much more greenway could we get if the $11M was allocated toward greenway development instead? When you take into account the NCDOT and private investments, however, those wouldn’t necessarily happen for the greenway anyway. This is a selfish ask, but how can we fast track this project? I fully understand this needs to go through community workshops, be designed, engineered and built, and will require tons of logistics. I also understand that because of the proposed commitments from city, state and NCDOT, the project will have to wade through a sea of government red tape. But it’s something that could be used now and shouldn’t have to wait until 2023 to come to fruition. Overall I think this is a great project, and I’m encouraged by the Council’s attitude toward it. I just hope we can deliver a thoughtful, one of a kind, and striking asset that the city can call its own. Great examples of pedestrian bridges to emulate would be Continental Bridge in Dallas, Harbor Drive Bridge in San Diego or the Millenium Bridge in London. 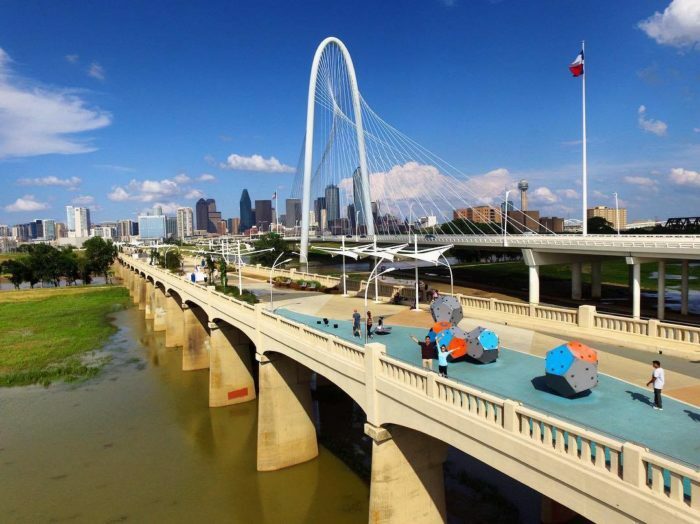 All these bridges are iconic, and although they’re more expensive, they’re also of greater scope than the proposed connection in Charlotte. Of the three, Continental Bridge is probably the best example, connecting an elevated walkway (similar to the Rail Trail) filled with green space and interesting programming, connected by a modernist 400 ft span. And its price tag: only 800k more than our proposed Rail Trail bridge budget.